NL3420 is a stripwound galvanized metal hose that is manufactured by spirally winding a preformed continuous metal strip (0.030" thick). A special high temperature packing allows this hose to be used for suction or discharge up to 100 psi and for use up to +232°C (450°F). Standard lengths are 20ft (others available from the factory) with reusable solid male NPT (N342xMR-xxxMI) or swivel female pipe ends (N342xFR-xxxMI). DO NOT twist the hose during installation as it will cause the hose to unwind and result in leakage/failure. DO NOT flush with diesel or fuel as it will degrade the packing material. Typical Fittings: Specially designed reusable fittings for metal hot tar & asphalt only. DO NOT twist the hose during installation. 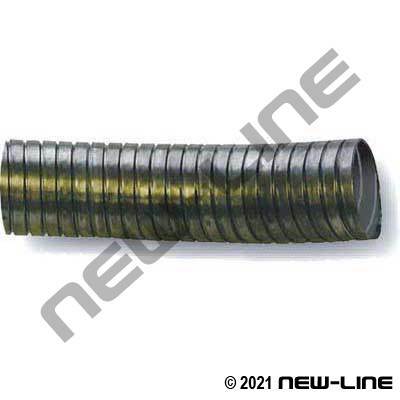 Construction: Slightly ribbed, stripwound galvanized metal hose with a high temperature packing. The NL3420 Heavy Duty is made from 0.030" metal strip and the NL3421 Light Duty has a 0.018" thickness. Temperature Range: -29°C (-20°F) to +232°C (450°F) under continuous service.